A Highland community is mourning the loss of a “beautiful girl” whose battle with cancer touched everyone’s hearts. Daisy Belle Nicol, from Corpach near Fort William, was diagnosed with an aggressive brain tumour when she was just nine months old. But sadly, despite going through surgery to have the tumour removed and intensive chemotherapy, the little girl died in her parents’ arms on Saturday. 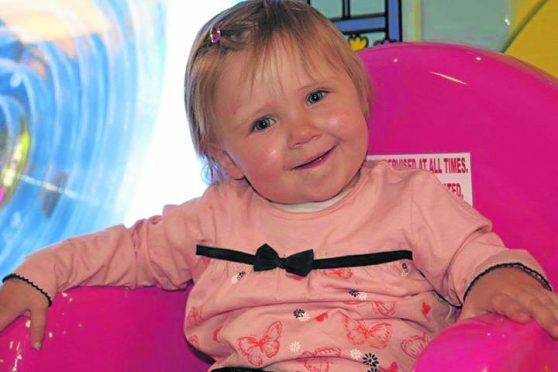 Her mum and dad Leah and Gary, Daisy’s brother Dylan and the rest of the family are devastated at the loss of the little girl whose big blue eyes and “cheeky” smile charmed everyone who met her. Mrs Nicol said that her two-year-old daughter wanted to do everything her way until the end. She said: “Daisy was our feisty, determined, beautiful girl. “She knew her own mind and did everything her own way right until the end. Daisy was so very strong and she gave Gary and I the strength to keep going. Mrs Nicol added: “Gary and I are so honoured to be her mummy and daddy – we couldn’t be more proud. Daisy first became ill in January 2016 when she started vomiting, became lethargic, then stopped tolerating food. She was admitted to Raigmore Hospital in Inverness, but was sent home without a diagnosis. She fell ill again a month later and her parents took her back to Raigmore. A scan showed she had enlarged ventricles, so she was transferred to the Royal Hospital for Children in Glasgow. A MRI scan revealed she had a brain tumour. Daisy later had surgery to remove it and a shunt was fitted to relieve pressure on her brain. She also had to undergo intensive chemotherapy. The local community rallied round to support the family and the Daisy Fund was started to ensure the brave little girl could get the best treatment possible. Fundraising activities were organised by local schools, clubs and individuals and a crowdfunding page was established. Donations poured in raising the amazing sum of £27,133 before the fund was closed last year. Daisy’s funeral will be held on Monday leaving from Caol Community Centre at 2pm followed by a private interment at Glen Nevis Cemetery. Everyone is asked to wear bright colours and donations in Daisy’s memory will go to Robin House Children’s Hospice.